Casio constantly works on improving their G-Shocks and as we can see this year they came up with very exciting models that have improved specifications. What people complained about on the previous models seems that was now fixed or taken rid of. 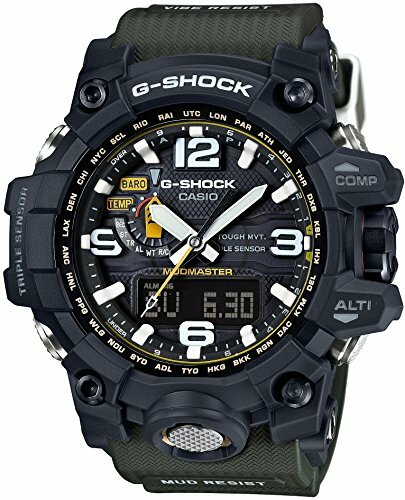 From mid-2014 until today it seems that Casio returned to a somewhat traditional approach by releasing mainly analog-digital G-Shocks with a modern feel. Without any further ado I present you some of the best G-Shock models from 2016. Right here I present you the grand father of all G-Shocks. The MudMaster is a colossus even if you compare it with other top G-Shocks. Recently released in mid-2015, it basically features an incredible amount of functions encapsulated in an extremely tough and high-quality casing that is, of course, shock resistant, vibration resistant, waterproof, low temperature resistant (-10C / 14 F), you name it. In a nutshell it features a countdown timer measuring unit, 5 independent daily alarms with hourly time signal, auto calendar, battery level indicator, full auto double LED backlight with afterglow, an incredibly reliable solar charging power system, automatic radio wave reception up to six times a day, digital compass, barometer, altimeter which has a range of (-700m to 10000m / -2300 ft to 32800 ft), thermometer, world time with 29 time zones, and so many more. These are just the tip of the iceberg. The back panel and the index hands are well illuminated and are easy to read even if you find yourself at 200 meters underwater. The band has a very simplistic and tough connection so that you won’t need to look at the band when you close or open it and more importantly not having to worry that it may ever come off when you do not want it to. I already assumed that you like big watches because the Mudmaster is exactly that, a huge watch. Everything about it is overbuilt and ready not only for dust, mud or shock but also for some hard knocks and extremely harsh treatment. This is why the Mudmaster is not for fairies. It’s a tough watch for tough people. 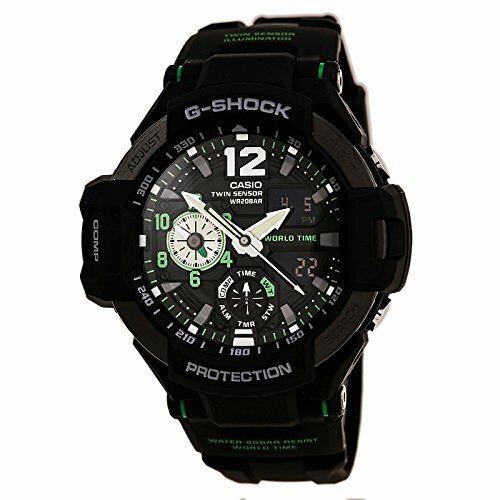 If you have the money to make the purchase this is one of the greatest if not the greatest G-Shock money can buy. This is why I highly recommend it to anyone who can afford it. You will see how truly impressive it is right when opening the box. The GA-110TS Ana-Digi G-Shock is one of the cheapest G-Shock from the selection I made but don’t think that it is bad in any way. It actually offers one of the best values for the money throughout all the G-Shocks I have seen. It is shock resistant, magnetic resistant (a feature that you rarely see on any watch), waterproof up to 660 feet or 200 meters and the window is scratch resistant. Some of the most important features are the following: World time with 29 time zones along with the city code display, 1/1000 second stopwatch, countdown timer, 5 daily alarms, a battery that has a life of approximately 2 years, full auto calendar and a nice resin case and comfortable band. Remember that this is a very appreciated watch that has been bought by thousands of people worldwide and until now it seems that most of them have good words about it. Although it’s great in most situations it has a drawback that I find to be frustrating. The illumination is not the best I’ve seen because the hands don’t have any kind of paint that glows in the dark only a backlight that kind of illuminates the whole screen but not enough for very dark situations. For the money you are paying this watch is a bargain. You get an extremely rugged watch with lots of useful functions that will make your life easier. If you consider it has what it takes the G-Shock Ana-Digi watch is a great bang for your bucks. At a case diameter of 5.1 centimeters, a thickness of 16.6 millimeters and a weight of 3.04 ounces the G Shock Sky Cockpit is yet again a pretty big watch. It features a versatile design making it suitable for both active or casual environments along with its illuminated hands and numbers indicators. The Aviation line tends to have a more traditional design as Casio decided to use analog hands, but I consider this a plus in terms of better readability in harsh environments. The display is complex yet clear enough to read in most conditions, and the backlight is a surprisingly bright violet color that will make everything clear even underwater. The Sky Cockpit features a dedicated world time sub dial, which means that the dual time is visible anytime, a digital compass that uses the small hand as the north indicator with the data available also on the digital display, a very nice „hands of the way” feature that will force the hands to go in positions that make visible all the other indicators, a temperature sensor that can measure between 14 F and 140 F, and of course five alarms and hourly charm. What I found to be somewhat frustrating is the fact that the alarm has no snooze option. This is a pretty minor thing compared to other more important features that the Sky Cockpit did get right but I thought it is important to highlight it. 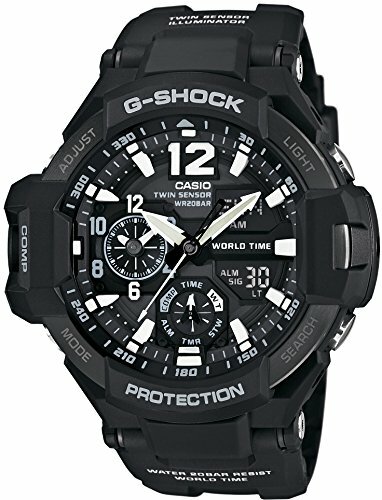 Bottom line: A G-Shock that comes at a pretty reasonable price and has the great features you would expect from a G-Shock at this magnitude; things like a very tough and high-quality casing and lots of sensors are all put together by a beautiful design suitable for multiple environments. The G-Shock Steel Smoke Dial comes with a new design that sets it apart from other G-Shocks. The metal casing and high-quality rubber band show from the start that Casio really was into designing a more stylish G-Shock with a modern feel. The Neo-Brite luminous hands will let you read the hour in dark situations along with the marking in the right of every hour. As said before new materials have been used in the manufacturing of this watch in order to create a two-layer guard structure that confers it a great shock resistance that you rarely see on other watches. Stainless steel has been used in the upper part and a shock absorbing resin is employed in the lower part to ameliorate on every impact or shock. As the previous model, the G-Steel also features a „hands out of the way” function which will put the hands in a position that will let you see all of the background indicators. The rest of the functions are similar to other top G-Shocks like alarms, world time, chronograph, dual time display, high intensity LED light and many more. The height of the resin layer is thick and it is followed by a brushed stainless steel layer that’s highlighted with the same stainless steel on top which runs adjacent to the buttons. This is yet another way Casio added a touch of class and refinement that also helps to the overall structure resistance. The final layer that comes with filled engravings is a stainless steel bezel and the smoothed outer layer structure has a matte finish. As a conclusion, I consider that this is a G-Shock that has an added feel of refinement due to the design, quality of materials and incredible craftsmanship that Casio proved to be capable of. 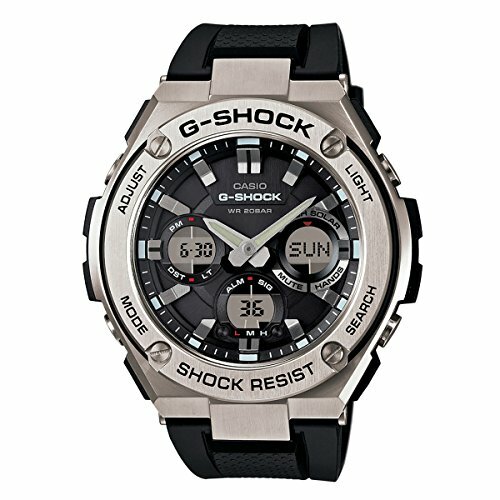 This is a great G-Shock for people who also want a sense of style from their multi-functional watch. The Casio Gravity Defier GA1100 is a new approach to the last year’s Gravity Defier GW1100 and it comes with improved accuracy, exciting new functions and a different backpanel. At a total weight of 3 ounces the Gravity Defier is as you might expect a big watch that generally fits large wrists better, but still, compared to the MudMaster G Shock which weighs 4.16 ounces, the Gravity Defier is not that humongous. The watch features a very bright illumination technology „Super-Illuminator” as Casio calls it, that can be activated with the touch of a button. The luminous coating on the hands and hour markers are very bright and will offer great readiness even in very dark environments. Other features include a digital compass; the narrow hand will indicate north due to the built-in sensor, a thermometer that can measure temperatures ranging(-10 C / 60 C or 14 F / 140 F), a stopwatch function, a countdown timer, daily alarms, „hands out of the way” feature that sets the hands in a position that makes reading of the other indicators possible. Speaking about the casing and materials it has a high-quality mineral glass window that tends to be tough and scratch resistant as opposed to the sapphire crystal that is more shock resistant. I sincerely prefer the mineral glass over the sapphire crystal because of the way it behaves over time but that’s more of a personal opinion. The stainless steel resin (stainless steel on top and edges and base made of resin) case is of incredibly good quality and trust me it can be reliable for lots of years from the moment you buy it. The band material is a good-feeling resin that Casio pretty much used in all G-Shock with some exception, so nothing new here. That’s pretty much it, of course when you will first have the Gravity Defier in your hands you will discover a lot of things like how its functions work and what they can do to make your life better or how does it feel on your wrist, things that I cannot cover here, but generally if you want a bold great looking G-Shock with plenty of sensors coming at a reasonable price, the Gravity Defier is definitely for you. 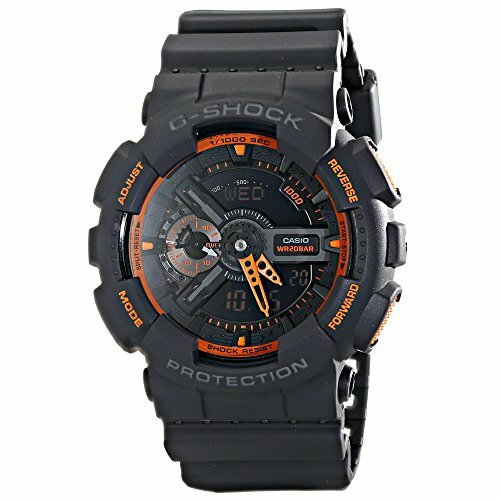 It seems that Casio keeps it up very well by releasing all these great G-Shocks to fulfill the customers requirements. Some may say that the future is for the smart watches but I strongly disagree with that. From my experience G-Shocks are more actual than ever and are continuing to be a great choice for everyone that wants a tough watch with tons of functionalities.